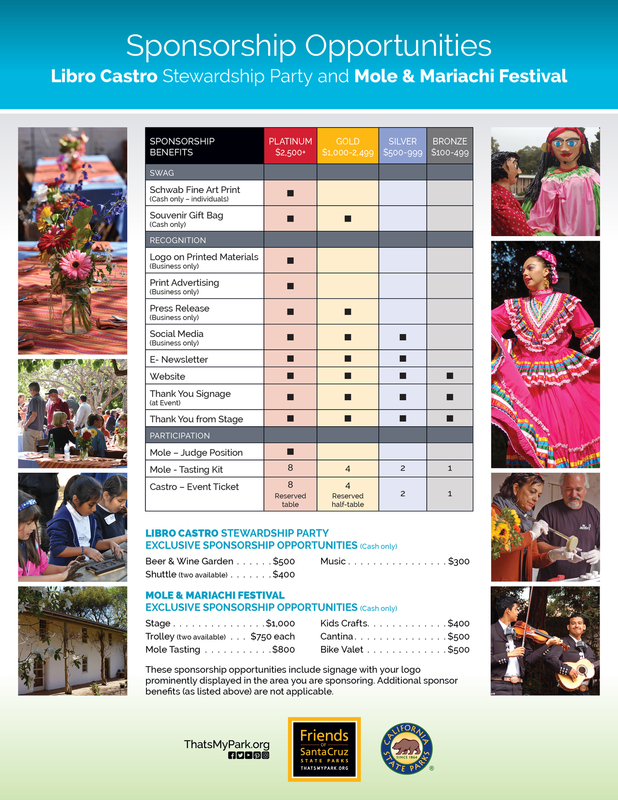 Libro Castro is a fundraising party and book launch to honor Castro Adobe stewards from the past and celebrate the recent progress toward opening the Castro Adobe, the first State Historic Park in the Pajaro Valley. The event will be 4-7 p.m. Saturday, June 23. Tickets are now available. Cost is $75 per person, including food and drink, or $100 with food, drink and a copy of the book. All donations will be matched 1:1 by the James & Carol Toney Fund. This year’s stewardship event honors the Paizis family, who owned and cared for the property from 1959-1963, and also celebrates the launch of the second edition of Suzanne Paizis’s chronicle of the Castro’s history: The Castro Adobe in the Twentieth Century: From Earthquake to Earthquake. The event will pay tribute to John Paizi’s Greek heritage with assorted Mediterranean food. Wine from Storrs Winery, local beer, and made-to-order espresso and tea will be served. Early 60’s period address is encouraged! The Castro Adobe site is fragile, so guests are encouraged to park offsite at the Strawberry Business Center at 125 Hangar Way in Watsonville. Free shuttles will be running through the evening, but some parking for mobility-impaired guests will be available at the Adobe. But guests who do take the shuttle will be given a free ticket to enter a raffle drawing. Explore Castro Adobe State Historic Park during the first public open house of 2018, 11 a.m. to 3 p.m. Saturday, January 27th. The event will focus on the early period of the Adobe and the Castro family’s prominent role in local and California history. Visitors can enjoy homemade nopales (aka prickly pear – a cactus salad) and fresh tortilla-making while getting the chance to share stories of their own family’s beginnings in California. Guided tours will be offered at 11:30 a.m., 1 p.m. and 2:30 p.m. A short presentation on the Castro family’s participation in the historic De Anza Expedition will start at 2:15 p.m. The event is free. The Castro Adobe is at 184 Old Adobe Road in Watsonville. Parking is limited; please carpool. Leashed dogs are allowed only in the parking area. 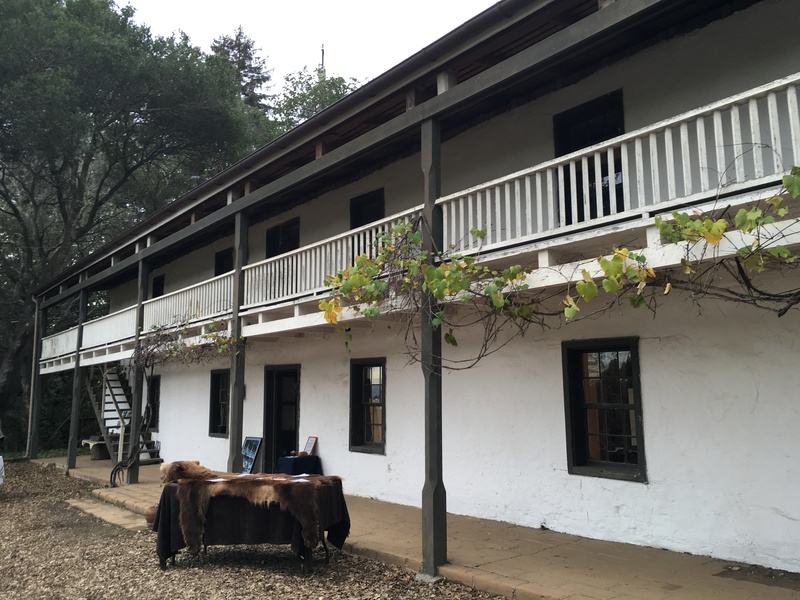 If you have never been to see the Castro Adobe, this is a great opportunity – it is an amazing structure in a beautiful setting, and loaded with early Santa Cruz history. Bring your entire family, invite your friends – but please carpool, because parking is limited. Friends of Santa Cruz State Parks today announced it will host Vaqueros on the Rancho, a ticketed event at the Castro Adobe State Historic Park, to share the tradition and skill of vaquero horsemen while raising funds to support the full opening of Castro Adobe in the Pajaro Valley. The special event will be 1-4 p.m. Saturday, May 6, at Castro Adobe State Historic Park, 184 Old Adobe Road. Tickets are $25. At Vaqueros on the Rancho two traditional vaquero-style horsemen will share aspects of early vaqueros along with how and why the culture is maintained today during a demonstration at 2 p.m. Jeffery Mundell and Victor “Buddy” Montes will show their horses and gear along with the art of using a 60-70 foot rawhide riata for “big loops.” Attendees will have the opportunity to learn how the traditional vaquero’s knowledge of land comes into play today with grassland conservation programs. Vaqueros on the Rancho also will include light refreshments, tours of the Castro Adobe as well as artisan and craftsmen wares on display and for sale, including: spurs, bits, silver and leather items and braided rawhide. Friends is leading a multi-year restoration effort to preserve and interpret the Castro Adobe as the region’s next State Historic Park and the first non-beach State Park in south Santa Cruz County. All proceeds from Vaqueros on the Rancho will be dedicated to this effort. From the first Spanish expedition into Alta California in 1769, the vaquero played a significant role in California’s heritage. Vaqueros, or horse-mounted livestock herders, of the Americas came from Spanish Mexico to California, and their “culture” developed into a fine art through the Mission and Rancho eras, and continued into the early 1900s. At the Rancho San Andrés Castro Adobe, herds of cattle and livestock grazed the land under the mounted vaquero’s watchful eye. 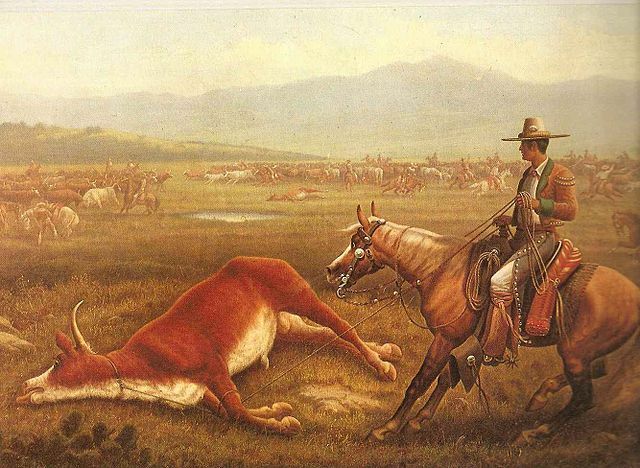 The vaqueros were skilled in the use of the rawhide riata for cattle sorting, roping, branding and slaughter, as well as roping grizzly bears. The rider and the horse worked in partnership with the slightest of “cues” hardly noticeable. True horsemen were held in highest regard for their patience, knowledge and skills regarding horses, cattle and the land. Tickets ($25 each) are available on Eventbrite (https://vaquerosontherancho.eventbrite.com) or by calling 831-429-1840. Advance ticket sales only. Additional donations are gratefully accepted. All donations and ticket sales will be matched 1:1 toward the opening of the park, up to $317,920 by the James & Carol Toney Fund. Ranch Manager, Rancho Cienega del Gabilan, part of an original Mexican land grant of 1834, remains an 11,000 acre working cattle ranch in the Gabilan hills of San Juan Bautista. 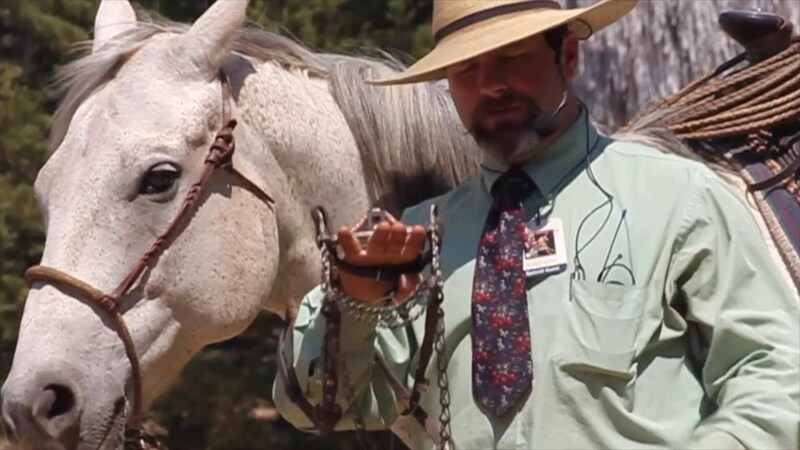 California born and raised, Jeffrey became intrigued with California bridle horses at age 12 watching and listening to old-style vaqueros start young colts. He remembers first seeing Spanish spade bits, riatas, silver on saddles, headstalls and spurs those vaqueros used, and felt privileged to meet and work with horsemen following old bridle horse traditions. In 2003, he moved his family to Oregon where they began a cattle operation and lived the buckaroo lifestyle which came from the early California vaquero. 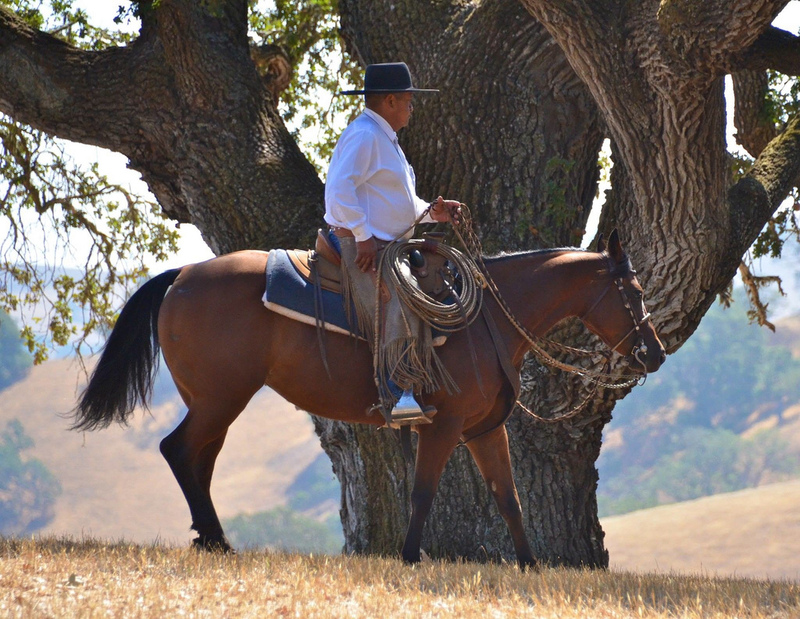 In 2014, they returned to California to manage the Rancho Cienega del Gabilan, respecting vaquero traditions in horsemanship and stockmanship on this historic cattle ranch. Raised on California’s historic Tejon Ranch in Kern County, one of four Mexican land grants acquired in1874 to form Rancho El Tejon which totaled over 300,000 acres. He is a 5th generation Native vaquero and a member of the Tejon Indian Tribe. Buddy continues his family vaquero traditions which began on El Tejon prior to 1874. He is manager [cowboss] of Booth Ranches based in the San Joaquin Valley. During his early years on the Tejon, Buddy began at the bottom and over time earned respect of the viejos [old wise vaqueros] who slowly shared their knowledge of making bridle horses – the purpose and techniques for using jaquimas [hackamores], spade bits and rawhide riatas. In the 1980s, he worked the great open range ranches of Nevada, some covered as many as four million acres. Returning to California, he worked on the Onyx Ranch and the San Emigdio prior to accepting the manager position at Booth Ranches, where both he and his wife manage the cattle operations retaining the old traditional vaquero style in horsemanship and handling cattle. Joseph Carr Ritchie, the California State Park Interpreter for the Castro Adobe State Historic Park, will be leading two free Castro Coastal Campfires in July and August. Folks are invited to go and learn about about the historic Castro family’s coastal connection at a Sunset Beach State Park campfire program. Ritchie will explain the link between Santa Cruz County’s first State Beach, Sunset State Beach, and Castro Adobe, the county’s newest State Historic Park. The free event will be offered at 8 p.m. on Saturday, July 23rd, and Saturday, August 20th. Back in the day, these two properties, currently property of the California State Parks system, were part of a larger land grant holding of the Castro family. The Castros arrived in California as part of the Anza Expedition 240 years ago and eventually made their way to Santa Cruz County. During the Mexican Rancho period of 1821-1850, they grazed cattle in the coastal hills and shipped hides from an embarcadero (wharf) that once existed between Sunset and Manresa State Beaches. The program, which includes a slideshow, hot chocolate and roasting marshmallows, aims to bring local families out to experience the State Beach and enjoy the bilingual (English/Spanish) presentation. The talk will be in the campground area at Sunset State Beach, 201 Sunset Beach Road in Watsonville. The program is free. Parking is $10 and supports the park. Participants will be invited to future Open House events at the Castro Adobe State Historic Park. Are you a horse lover? How about a history lover – or better yet, both? Then you will be interested to check out the Vaquero Heritage Tack Talk at Castro Adobe, to be held on Saturday, June 25th at 1:30 PM at the Castro Adobe. Noted historians Griff Durham and Bruce Haener will speak, and share examples of vaquero and horse gear from the mid-1800’s onward as appropriate for the era of the Rancho San Andres Castro Adobe. Parking at the Castro Adobe is extremely limited, and carpooling is encouraged. This event is a fundraiser, and tickets are $25 to $100, and attendees may select the amount of their donation. Refreshments will be provided, and guests will have an opportunity to tour the historic home and grounds. To RSVP, please call 831-429-1840 or email castroadobe@thatsmypark.org. This event is co-sponsored by Friends of Santa Cruz State Parks and Vaquero Heritage Times. The Castro Adobe State Historic Park is located just outside of Aptos, in Larkin Valley. It’s one of the very oldest structures in Santa Cruz county, and one of only four adobe structures left standing within the county. It’s also one of the few remaining two-story adobe homes anywhere in California. The Friends of Santa Cruz State Parks is working with the State of California to open the site as a California Historic Park. Although the Castro Adobe is located outside of the limits of Aptos proper, it is historically important to Aptos and the Pajaro Valley region. The Castro family was one of California’s earliest and most prominent Spanish families, having arrived with the Spanish explorer Anza in 1775. The Castro Adobe was built between 1848 and 1850. Good news for folks interested in the Castro Adobe…if you missed the last few times it was held open, you’ll be happy to hear that the Castro Adobe will be open to the public on November 14th and December 5th. Admission is free with donations to support the park gratefully accepted. Located in Larkin Valley, near Watsonville, the two-story Castro Adobe, built between 1848-49, is one of the finest examples of a rancho hacienda in the Monterey Bay area. Open House visitors will be able to tour the property including the restored cocina (kitchen) and the Potter-Church Garden. The garden is a unique outdoor space originally created by then-adobe owners Elizabeth and David Potter from 1968 to 1972, in consultation with noted landscape architect Thomas Church. State Park Interpretive Rangers and Friends’ volunteers will be on hand to offer a “sneak peak” into the restoration process and to assist visitors who would like to enjoy handmade tortillas cooked on the recently reconstructed brasero (stove). The Castro Adobe is located at 184 Old Adobe Road, north of Watsonville. Parking is extremely limited, so carpooling is encouraged. Friends is leading a multi-year restoration effort to preserve and interpret the site and is partnering with California State Parks to open the adobe as a State Historic Park. It is Santa Cruz County’s second State Historic Park and the first non-beach state park in the Pajaro Valley. 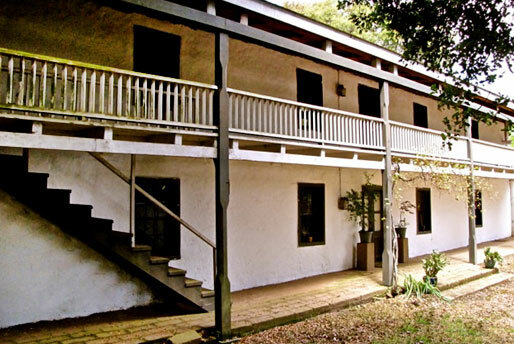 The Castro Adobe is open on a limited basis for special events, such as Open House Days. To follow progress on the restoration effort, visit www.ThatsMyPark.org/projects/castro-adobe. Friends of Santa Cruz State Parks (Friends), a local nonprofit serving 32 state parks and beaches in Santa Cruz and San Mateo counties, announced it has been awarded a $100,000 grant from the Monterey Peninsula Foundation, host of the AT&T Pebble Beach National Pro-Am, to fund the ongoing restoration of the Castro Adobe State Historic Park. Located in Larkin Valley, near Watsonville, the two-story Castro Adobe is one of four adobe buildings remaining in Santa Cruz County and one of the finest examples of a rancho hacienda in the Monterey Bay area. Friends is leading a multi-year restoration effort to preserve and interpret the Castro, and is partnering with State Parks to open the adobe as a State Historic Park. A phased opening started this year with school group tours and public open house events, which continue on August 14th and 15th. The Castro Adobe will be Santa Cruz County’s newest State Historic Park.